West End Garage invoice, 1947. Homepage. This page: An invoice documents one firm's petrol usage during October 1947. Unlike many invoices that feature here of this era - the late 1940s - this one is quite modestly illustrated. It was issued by a Mr Frank Sykes, working out of the West End Garage in Marsden, West Yorkshire, in 1947. It featured a simple illustration of a sleek four-door saloon, and an over-size petrol pump. 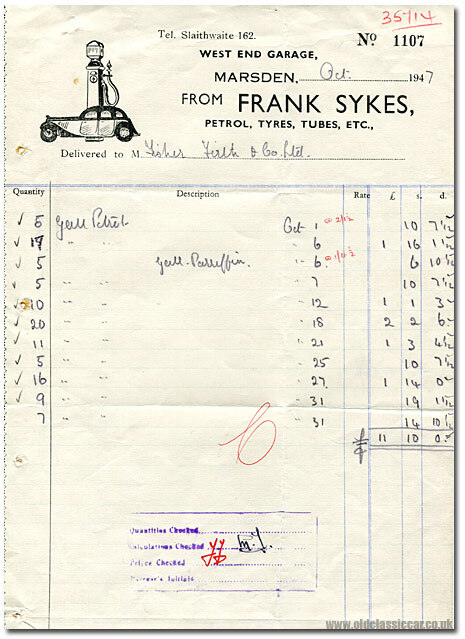 The invoice itemises the petrol purchased by one local customer, Fisher Firth & Co. Ltd, of Cellar's Clough Mill. The latter was a producer of woollen goods, which may explain their usage of motor fuel at a time when it was still under ration - perhaps for one or more company lorries. The winter of 1946/1947 was a particularly rough one for the country, so no doubt the firm was encouraged to produce as many garments as possible, in case there was a repeat of last winter's problems. There are some interesting recent photos of the Mill on this external site - the two car scrapyard pages are also worth a look ;-) . But what of "West End Garage"? There still appears to be a garage of that name in the area, situated on Manchester Road. At the time of this invoice though, 1947, it would seem to have been one of the smaller businesses of its type operating in the area. The RAC handbook for 1949/1950 doesn't make a reference to West End Garage, but instead lists W.H. & F. Schofield as being an approved repairer in that area, also situated on Manchester Road. An illustrated invoice for Schofield's can be found here.